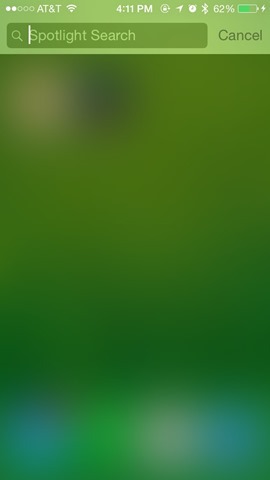 I've been running iOS8 for a while now in Beta, and today all my iDevices are running the released iOS 8. 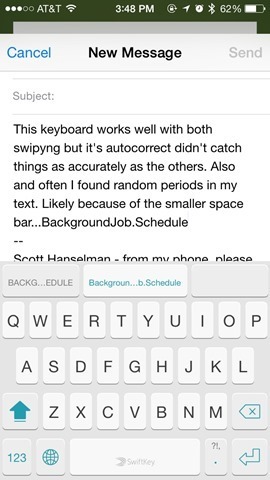 One of the most anticipated new features is the ability to create and add 3rd party keyboards. In the future I anticipate we'll see lots of interesting and creative keyboards, perhaps to draw an emoji with your finger, custom Chinese or Japanese IMEs (input method editors), and others. Until then, the primary thing folks have been waiting for is what Android and now Windows Phone have had for a while, the ability to type without lifting your thumb. You'll either love it or hate it, but you need to try it for a day. When done well, it's amazing and brilliant. 3rd Party Keyboards install from the AppStore like any other app. When you run each for the first time they walk you through the process of installing their keyboard. This is easy for a techie, but for your non-Technical Relatives it might take a little coaching as you'll end up 3 or 4 deep inside Settings | General | Keyboards. Swype worked great, exactly as advertised. I enjoyed using it very much and it's swiping feature works as advertised. I did feel its autocorrect somehow left something to be desired. Below you can see it getting confused as I swipe the word "autocorrect." The deal breaker for me with Swype was two-fold. First, the spacebar is smaller than the default space bar. It's a small thing to be sure (as tiny keyboards are) but it had me adding periods . throughout . my text, as I hit that before I hit the space bar. Secondly, the lower left corner of the iOS keyboard has always been the little 123 Icon. It lets you switch between ABC and 123, of course. Swype chose to move this over to the second spot. This flummoxed me all day. 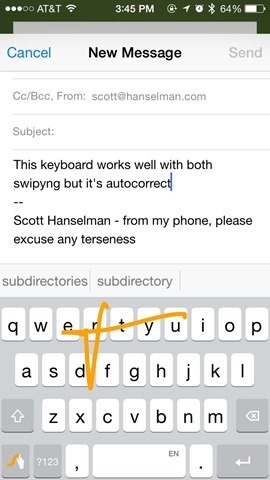 I'm sure I could train myself as it's just muscle memory, but it was an unusual choice, I thought, and this is just one place where Swype deviated their keyboard design from being "just a swiping solution." They've moved other things as well. Opening the proper Swype button in the lower corner with a press and hold brings up the Globe (usually not hidden in other keyboards) as well as the Dial Pad for numbers, and the Settings gear. Swype has moved some things and this slowed me down quite a lot. This keyboard below moves all my symbols to new locations, with the Asterisk nowhere to be found! 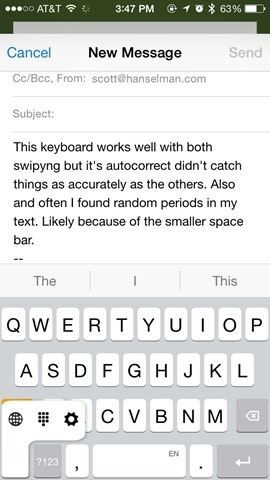 NOTE: One thing that ALL these keyboards thankfully fix is the "shift key problem" with the default iOS keyboard. They show lowercase letters when you're typing lowercase, and change the whole keyboard to uppercase when you press Shift. 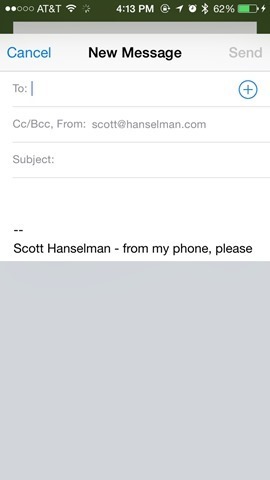 It's so painfully a problem with the default keyboard, it's really unfortunate that this wasn't changed in iOS8. Swype also includes funky themes with background images if you're into that level of customization. SwiftKey is free, but they intend to make money by selling us keyboard things. For now, I'm thrilled with the default, as seen below. It looks almost exactly like the default iOS keyboard, which is what I'm looking for. I don't want to relearn where things are when I just want swiping and a few other features. SwiftKey keeps all the symbols and numbers exactly where they usually are, and adds a few nice touches like a gentle reminder than I can touch-and-hold on punctuation for additional choices. One odd bug I saw with SwiftKey - If I turn off "Allow all Access," in Settings | General | Keyboards, SwiftKey ignored my white theme choice, showing me only a black keyboard with a reminder to turn on All Access. I presume this is a bug, as it's definitely wrong. 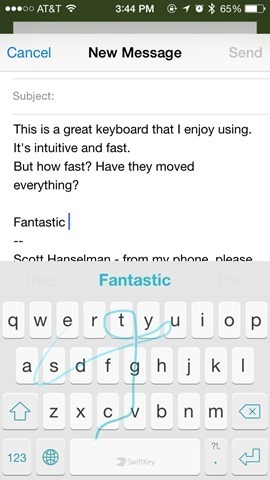 Other than this one issue, I'm digging SwiftKey. There is also a free Chinese keyboard called TouchPal that includes swiping input, keyboards, themes and a focus on Emoji. The Emoji are included in the keyboard, meaning your don't need to switch to the Emoji keyboard. That said, I installed it and my phone locked up. I rebooted and had no keyboard until I removed TouchPal. I think this experience speaks (IMHO) to the larger issue of stability with 3rd party keyboards on iOS, but this is only from my perspective as a user. I was unable to get TouchPal working. Here's the kicker for a lot of people. In order to make predictive text suggestions, sometimes these keyboards need to send what you're typing to their cloud engine. Be sure to read their privacy policies to make sure you're comfortable with how they use your data. For users that opt in to SwiftKey Cloud, we will collect your email address, basic demographic information and information concerning the words and phrases that you use (“Language Modeling Data”) to enable services such as personalization, prediction synchronization and backup. We may use data provided by you to develop and improve our Products. Where a field has been flagged by a website or app as denoting a password field or payment information, SwiftKey does not log, store or learn from this information. Be educated, but I'm OK with using these keyboards for basic email. Of course, you can (and will) switch keyboards many times a day if you're like me. If you type technical (or Medical, or Legal, or whatever) things a lot, you'll likely find some very odd predications with these keyboards. Here SwiftKey has clearly looked at my history and is suggesting something totally wrong...and offering to Capitalize it also! Autocorrect has always been a problem, but don't expect a 3rd party keyboard to fix it...although these ones aim to try! Theoretically they'll learn even more from what I type. A number of times I've found myself looking at a text box with a flashing insert point waiting for a keyboard to pop up. These keyboards need to LOAD and sometimes that causes a pause, or when things go wrong, they just never show up. 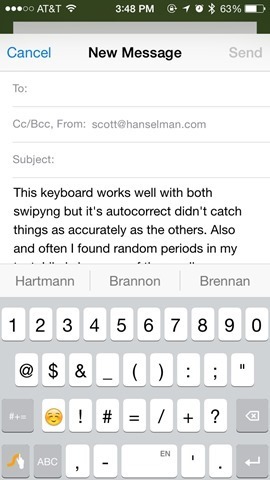 In a word, there's bugs all around, in both the Keyboards, I suspect, and in iOS8's handling of them. Here I am, keyboardless. I had to reboot at this point. Your mileage may vary. Mark my words, I predict bug fixes for a the supporting APIs for 3rd Party Keyboards will be coming in the next minor update to iOS8. NOTE: Neither of these keyboards includes a Microphone Button to start Siri's built-in dictation. As such, these keyboards won't work with my app, myEcho. This appears to be a limitation imposed by Apple, that won't allow us (developers) to invoke a dictation without using their button. If you want to dictate (which is almost a keyboard on its own...I'd like to see a giant "Dictate now" button, myself) then you'll need to switch to the built in iOS keyboard. My recommendation? YOU should try them all and see which one makes you happy. If you are very much a touch typist and you want a swiping keyboard that doesn't deviate far from the default, I recommend SwiftKey. I've just downloaded SwiftKey and if I have 'Allow Full Access' turned off, the keyboard doesn't appear. You mention that it only shows the dark theme when Full Access is off but on my iPad it doesn't show anything. The instructions and support website say that Full Access is required so I'm wondering how it works for you with Full Access turned off? Am I doing something wrong? Weird. I'll try it again here. I had the same issue and uninstalled the Apple Keyboard and every thing works. I don't know if that was a wise decision, but I figure a reset is always possible. Thanks for the tip Tim. I tried it with only the SwiftKey keyboard installed and Allow Full Access turned off and it did work intermittently. With Allow Full Access turned on it seemed to work every time. I think I'll just wait for an update to see if it gets more reliable. The SwiftKey did not allow me swype typing if I had "Allow Full Access" turned off. It did work when I turned "Allow Full Access" on. Is this a bug OR it is supposed to work that way? Just wondering as I did not see that written in here. Swype doesn't work for me at all with SwiftKey. How do you turn it on? In regards to the space bar size being an annoyance (disclaimer: I haven't used Swype on an iPhone, only an Android), you shouldn't be pressing the space bar very often if you're doing it right. When you swype a word and let go, just go on swyping the next word and it will insert the space for you. In fact, I believe newer versions of Swype you don't even have to let go -- just swype down to the space bar and keep going. Tom - assuming I'm swiping, yes. But I mix it up. It's also a problem for small corrections. Wonderful. So now there are two phone OSes capable of correctly processing Dutch (and potentially Papiamento) correctly. Maybe I should consider getting an iThingy. Is there a dvorak option in there? I keep trying all different keyboards and I always end up back with Swype (albeit on Android). -double tap the Swype button to select the current word. -Swype from the Swype button to x,c, and v for cut, copy, and paste. And from Swype to a for select all, and Swype to t/5 to bring up the number pad. -Swype to shift and lets you select capitalization. 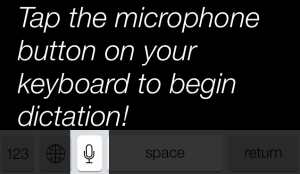 -uncanny Dragon speech recognition (again, Android only I'm guessing). -delete whole word with one backspace. There are features on SwiftKey that I wish I could bring over, and later versions seem to introduce some memory lag (especially with bigger bodies of text), but too much good stuff. Thanks for putting this out, I was looking for something similar last night and of course Scott Hanselman comes through again. Have you tried Fleksy? 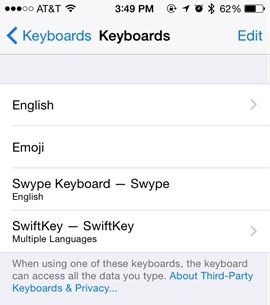 It seems like that Swype, SwiftKey, and Fleksy are the big three on iOS right now. When I get a text and I open messages and Swype is the default keyboard, it's not at the most recent message and I have to scroll down to the latest message to see what the other person sent? You should try Fleksy and Minumm, they're both amazing keyboards. 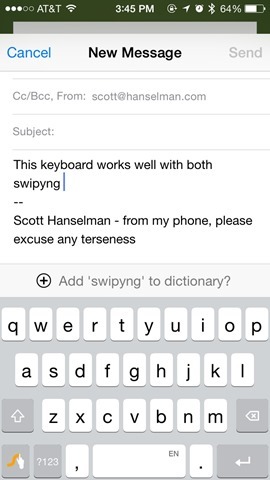 Can't wait for SwiftKey to add swipe on the iPad, that was a let-down. Swype was behaving oddly for me last night, I've not yet gotten back to more testing. But, while replying to a tweet in TweetBot on my iPad, the text output just fine, but when I sent it, my text disappeared, leaving only the recipients in the message. Not sure if this is a TweetBot or Swype issue, but have since removed both keyboards and will give them a shot after some updates or when I have more time to play. There's a bug in the messaging app with both of these keyboards. When you open messaging, the most recent messages display behind the keyboard, so I have to scroll to see them. Every. Time. I have an Android phone and love the native keyboard. 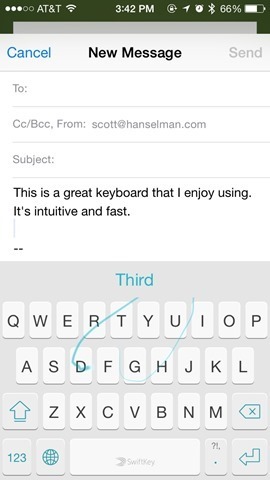 The gesture typing is pretty accurate on it and I've never felt the need to switch to Swype/Swiftkey. I have tried both, but keep going back to the native keyboard. Both keyboards seem limited to my personal use cases. None of my problems would matter to someone who only speaks English but in my case, I text/email/post regularly in three different languages and neither Swype nor SwiftKey is usable at this point. 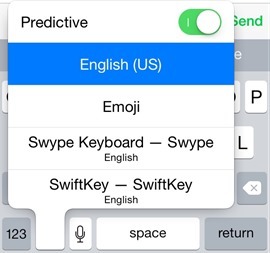 SwiftKey supports several languages _and_ dialects (French Canadian, Brazilian Portuguese) but is limited to only two active languages and changing them requires you to leave whatever app you're using. Again, not a problem for English-speakers (or, in the case of SwiftKey, speakers of only 1 or 2 languages), but a total deal breaker for me. All that said, the native iOS keyboard actually works well enough and the new predictive text is really good. If I read correctly, you aren't a fan of this "swift-typing" scheme on the iPhone, or at least it's current manifestation. Are you an avid user of the Windows Phone implementation? I've found it to be very accurate even when my gestures were not (my guess is that there are semantics/grammar heuristics involved) but I've not trained myself to use it exclusively. What has your experience with Windows Phone's "swift-type" implementation? Do you use it routinely? And do you think that your poor experience was because you weren't using the larger iPhone 6 models? I was about to buy Swype after updating to 8.0 yesterday, but the lack of a voice input button is really unattractive to me. Especially now with the streaming transcription, there aren't many situations where any keyboard is faster than letting Siri do the work. Needing to switch keyboards to get to the button seems just cumbersome enough that I'd rarely spend any time with Swype selected. Unfortunately none of the mentioned swype keyboards have a support for Dutch (except for Fleksy but that isn't a real swipe keyboard). I'm looking forward to the switch of an existing iOS7 app called Path Input which is already available for iPad and iPhone and will soon be upgraded to iOS8 keyboard. Path Input already supports Dutch in the current app and works great! Noticed a bug with SwiftKey while using Evernote, where the Return/Enter key in SwiftKey oddly doesn't seem to work the same as on the default keyboard. Normally, in Evernote (iPhone), if the current line begins with a checkbox (i.e. while writing a to-do list within a text document), when you press Return on the default keyboard, a new checkbox automatically appears on the next line. With SwiftKey, this doesn't happen, and the new checkbox needs to be added manually. Which is a hassle. Seems like an odd bug -- how complicated can sending a "Return" keystroke to the open application be? Complicated enough, apparently. Regarding the "Allow Full Access", this gives the keyboard permission to save your "language insights" along with other settings inside its container app. I think the reason you can't swipe to type with this off is because the app can't reference or store anything it's learned from your typing. This is also why it probably just defaults to the dark keyboard when you don't allow full access. If you set the the color scheme in the app, but don't allow full access, the keyboard has no way to retrieve it's setting from the app, since you've disallowed it. So, the dark keyboard is probably just the default case when this happens. I don't think this is a bug, more like an intentional error handling choice. SwiftKey seems to have an issue when using the URL bar in that if you attempt to do return, it just inserts a space first. Very annoying if you are attempting to correct a URL. One thing no one seems to have mentioned on any site is that when using the gmail app with Swype on the iPad it will not bring up the address book when composing a mail. Ie if you press the first letter in the'to'box you don't get an autofill from the address book /contact list and you have to type in the entire email address. This makes it unusable for me. I've had a reply from Swype about the issue I mentioned above. What surprises me is that no one else on any forum seems bothered about this gaping fault that gmail seems to be responsible for. "Thank you for contacting Swype Support! We apologize for the delay in this response. This issue is actually on Gmail's side. 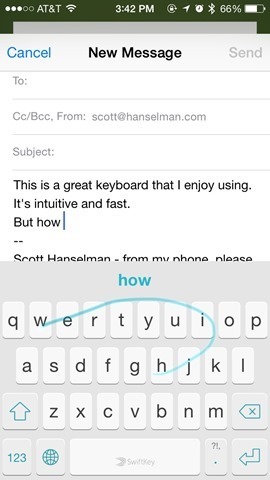 Swype only enters the letters and it is up to Gmail to interpret and trigger a contact suggestion bar. We have escalated it to them as it seemed that they are not compatible with the recent third party addition to the iOS. We are also fixing things on our end to make sure issues like this will be addressed. Please keep an eye out to the App Store for the latest Swype and Gmail updates. Feel free to reach me back if you have clarifications.